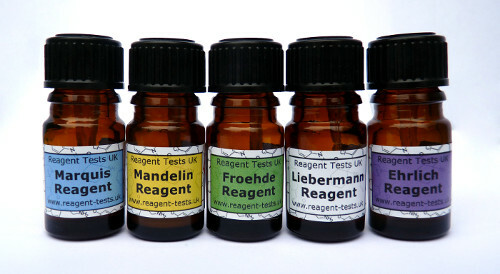 Reagent testing is an excellent way to massively reduce the risks of using drugs. With the ability to instantly see if what you have bought is fake or even unusually dangerous it’s much easier to make better decisions about drug use. Using just a scraping of a pill or a few crumbs of powder and a drop of reagent you can instantly see if you have been sold PMA, pentylone or other more dangerous drugs instead of what you were expecting. Our goal is to make it so cheap and easy to test for safety that every new batch of drugs could be tested. We neither condone nor condemn drug use, we are just here to help people stay safe. No more getting ripped off. No more ruined nights out. No more lost friends. We sell reagent test kits in high quality glass bottles with ultra-discreet shipping, including the popular marquis and ehrlich reagents; allowing people to test a vast range of substances including MDMA, LSD, 2C-B and many others. See instructions for testing the most common substances here. We use ultra-discreet packaging to ensure privacy for all orders.